Ichiya (一夜城祭り) matsuri in Hayakawa is held on the Ishigaki mountain top which was once the scene of the most unconventional siege in the history of Samurai warfare. The matsuri celebrates the fall of Odawara castle and a re-enactment of the events leading up to the Hojo clan surrender to Toyotomi Hideyoshi is a great spectacle. Ichiya matsuri in Hayakawa is held on the Ishigaki mountain top which was once the scene of the most unconventional siege in the history of Samurai warfare. 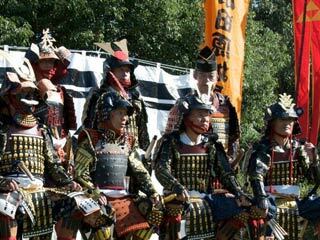 The matsuri celebrates the fall of Odawara castle and a re-enactment of the events leading up to the Hojo clan surrender to Toyotomi Hideyoshi is a great spectacle. People wearing hand-made armour relate the story of the siege and show that they are indeed proud of their heritage and history. In June 1590 Toyotomi Hideyoshi laid siege to the impregnable Odawara castle. This was the third time Odawara castle had been laid siege to. This was Hideyoshi's major move in eliminating the Hojo clan who were a threat to his dominance. The Hojo had hoped that logistical difficulties of the mountainous area would force Hideyoshi to call off his siege of their formidable Odawara stronghold. Hideyoshi's vast army however was well-supplied, and he built a solid base nearby to disrupt the enemy. This siege is recognised as one of the most unconventional in samurai history. Hideyoshi had a make-shift "castle" built on an opposing mountain top to that of Odawara castle on what is now called Ishigaki "stone walls" mountain. He had a moat and large scale walls constructed with baileys and defences matching that of any castle, but it was never intended to be anything more than a siege camp. The ruins are still quite visible despite the passing of time and the whole mountain top is now a beautiful park. In building the fortifications, Hideyoshi required that the surrounding towns provide ten days of labour in constructing the walls - one day of missed work would be punished by requiring five extra days work. Stone was hastily carried in and the walls were constructed in the traditional manner - but in half the time it would normally take for such a large construction. The temporary fortification rivalled any castle embankments being at the top of a steep mountain. The siege lasted three months and the besieging army was soon supported by the surrounding towns who saw an easy way to make a profit. Hideyoshi's army was soon supported by merchants in the area who brought in supplies and equipment. The samurai were entertained by everything: from concubines, prostitutes and musicians to acrobats, and jugglers. "We have surrounded Odawara castle on all sides with great rings of troops." Wrote Hideyoshi to his wife. "We have fortified an adjacent mountain with solid walls, we will not let a single enemy out." In contrast the Hojo defenders within Odawara castle slept on the walls of their castle with their arquebuses and armour. Despite their smaller numbers, however, they discouraged Hideyoshi from attacking and Hideyoshi knew all too well the impregnability of the great Odawara castle which had outlasted two previous attacks before. For the most part, Hideyoshi's siege consisted of traditional starvation tactics. Odawara castle's food supplies were cut off and support from surrounding satellite castles was blocked. A few small skirmishes erupted around the castle between the two sides, as when a group of miners from Kai under Hideyoshi's command dug an extensive tunnel under the walls of the outer bailey of Odawara castle, allowing the Samurai of Ii Naomasa to enter Odawara castle in secret using "castle entering techniques." After three months, the Hojo Samurai surrendered, facing overwhelming numbers and an impending shortage of food and supplies. Hojo Ujimasa committed suicide and the Hojo lost their control of the Kanto region. During the siege 40,000 men occupied Odawara castle while Hideyoshi had at his command over 200,000 men which he had spaced at junctions and all around the plains of Odawara. He also had three large ships sitting offshore in an attempt to bombard Odawara castle with cannon. Tokugawa Ieyasu, one of Hideyoshi's top generals who had actually spearheaded the siege, was given the Hojo lands. Though Hideyoshi could not have guessed it at the time, this would turn out to be a great stepping-stone towards Tokugawa's attempts at conquest and the office of Shogun.